GL Accounts are assigned to expense details to indicate where the money used to pay the expense's PO (Purchase Order) comes from. In order to determine which GL Account to use to reimburse a particular expense detail, advanced rules may be configured, as described below. If advanced rules are not required, the GL Account will be assigned based on the expense detail’s selected Expense Type. See Editing Expense Types for more details about this set-up. See below for advanced GL Account mapping configuration. 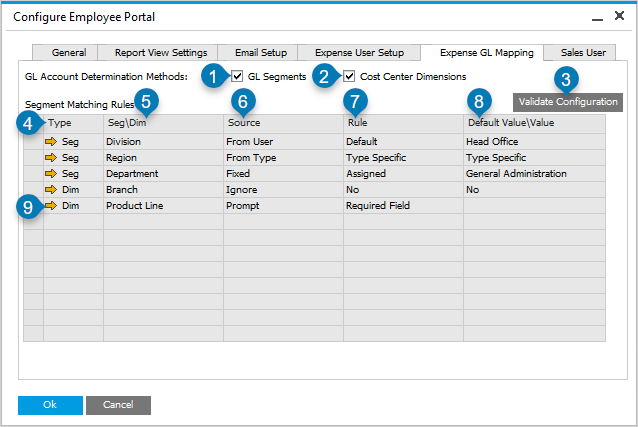 Employee Portal Configuration - Expense GL Mapping tab, as described below. In SAP Business One, go to: Financials > Cost Accounting > Distribution Rules. Display UDFs on the Distribution Rules - Setup screen. To do this, make sure the Distribution Rules - Setup screen is in focus, then go to View > User Defined Fields. 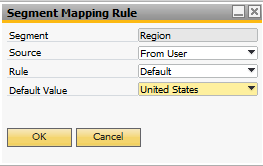 Configure web settings for each distribution rule. To do this, on the UDF section, set the Available on Portal option to Yes and set the Rule label on Portal to an admin-friendly label. This will be used during configuration of Dimensions. Typically, each Cost Center has a single distribution rule allocating 100% to that cost center. If this is not how your environment is set up, you may use multiple distribution rules that allocate different amounts to the same cost centers. These distribution rules are what are referred to throughout this documentation as “Cost Center Dimensions”. 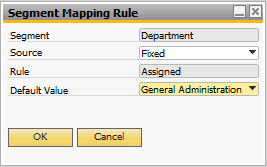 Advanced GL mapping rules can be configured for GL Segments, Cost Center Dimensions or both. GL Segments are sub-accounts that can be selected for a specified GL Account. Cost Center Dimensions are optional properties that may or may not be defined for a given GL Account. These settings are set up as part of General Ledger (GL) configuration. 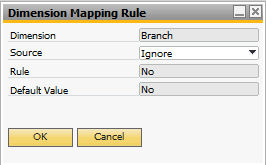 If either GL Segments or Cost Center Dimensions are configured in an SAP Business One company, then they may be used to configure mapping rules. 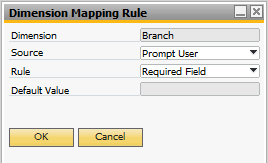 Mapping rules are applied to expense requests and expense claims, and specify GL Account details when creating Purchase Orders. To enable advanced mapping rules for either GL Segments or Cost Center Dimensions (or both), open InterConnect Manager AddOn > Administration > Employee Portal Setup > Expense GL Mapping tab and enable the check-box for the desired option (see markers 1 and 2 in the screenshot above). Once enabled, the available rules will be displayed in the Segment Matching Rules section (see marker 4 above). Mapping rules can be disabled again by un-checking the GL Segments or Cost Center Dimensions options. This will delete the rules, so any options that are disabled will need to be re-configured if they are re-enabled. Mapping rules can be configured by using the golden arrow drill-down for each segment or dimension (see marker 9 above). This option pulls the segment/dimension mapping from values assigned to the user. This option applies to both GL Segments and Cost Center Dimensions. Use this option to pull the GL Segment or Cost Center Dimension from the User details. This requires configuration on each user. Read-only. The name of the GL Segment or Cost Center Dimension. Select From User. This takes the user's assigned value and applies it to all expense detail lines. Defines how the detail will come from the user. Default is the only valid option at this time. Select the default value that will be assigned when setting up users. This can be changed on the Expense User details screen as outlined in Configuring Expense Users. This option pulls the segment/dimension mapping from values assigned to the detail’s Expense Type. This option applies to both GL Segments and Cost Center Dimensions. Use this option to pull the GL Segment or Cost Center Dimension directly from the Expense Type. This is the same behavior that basic GL Allocation adheres to, so this option treats the mapping the same as if it were in simple mode. Select From Type. This pulls the segment or dimension details as configured on the Expense Type. This setting is applied to the expense detail line. Read-only. This is always set to Type Specific. This comes from the Expense Type's assigned GL Account. See Add/Edit Expense Type for details on GL Allocation for Expense Types. Dimension details are selected manually by the user. This option applies to Cost Center Dimensions only. Use this option to prompt the user for a selection, which will be applied to the current expense detail line. Each detail line requires its own selection. This can only be applied to Cost Center Dimensions, as dimensions are optional attributes for a GL Account, while Segments are required. GL Mapping options - Prompt configuration. Read-only. The name of the Cost Center Dimension. Select Prompt User. This allows the user to manually select an option for each expense detail line, which will then be assigned to that line. This requires a separate selection for each expense detail line. Required Field - Forces users to select an option manually before the GL Allocation is valid. This means all users must select this dimension's option before they can submit their request or claim. Optional Field - Allows users to select an option manually. Users may skip assigning details to this field and the GL Allocation will still be valid. In this case, users can submit their request or claim without specifying this Dimension's details. Read-only. This field is empty. This dimension’s details are ignored. This option applies to Cost Center Dimensions only. Use this option to ignore this dimension on all expense detail lines. This can only be applied to Cost Center Dimensions, as dimensions are optional attributes for a GL Account, while Segments are required. GL Mapping options - Ignore configuration. Select Ignore. In this case, no option will be assigned to any expense detail lines for this dimension. Read-only. Always set to No. Assigns the configured value to the segment/dimension. This option applies to both GL Segments and Cost Center Dimensions. Use this option to always apply the same value for this GL Segment or Cost Center Dimension. This essentially hard-codes the value for all expense detail lines. GL Mapping options - Fixed configuration. Select Fixed. This will assign the same value to all expense detail lines. Read-only. Always set to Assigned. Select the segment or dimension option that best applies. This will be used on all expense types.